Hail and well met! We are the Figures in the Fog and today we’ll be reviewing the final new cards for Ashes: Rise of the Phoenixborn, added in The King of Titans. This is the fourth entry in this series, so be sure to check out the others here, here, and here. Without further ado, we present you 2 new Action Spells and a new Ally! Nature’s Wrath is a simple and cheap new Action Spell. For a Nature class, one damage is dealt to all units. Natural magic has always had a focus on the ground battle and damaging units, especially small damage, or “ping damage” as the cool kids say these days. Nature’s Wrath is certainly a powerful new option for Natural decks. The single die cost makes it easier to play than its close neighbor Mist Typhoon. You’ll need to be playing some of Nature’s big units, however, since the card affects all units, unlike the aforementioned Mist Typhoon. This makes it a little harder to play in swarm decks, unless paired with cards like Protect or Particle Shield. X: This card is effectively Meteor-Lite, dealing less damage and without the exhaustion effects. Unfortunately without the exhaustion affect, the card’s utility is greatly reduced. As is, this card fits best into 2 archetypes: the board clear archetype, like Meteor Jessa, or the big beaters archetype, like Big Deck Rin or base Xander. This card has some potential due to the number of different synergies, I just wish it was a Side Action instead, so it could be paired with Sacred Ground. N: I’m looking forward to playing this in Coal. More cheap AoE damage seems fun. I can also see this card finding a fun place in some sort of Dread Wraith/String Mage/Leech Warrior/Pain Shaman fiasco deck. It’s probably not a good deck, but it sure sounds fun to play. Next we’ve got another inexpensive action spell, this one costing only a single Side Action! For that cost Mass Heal removes one wound token from all units. 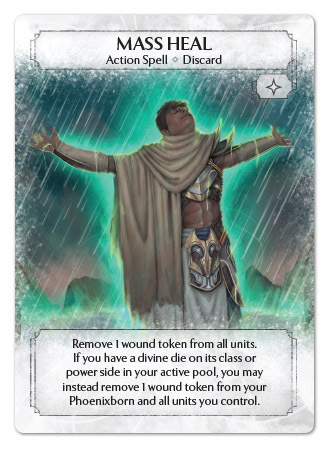 However, if you have a Divine Class or Power die in your active pool, you can choose to instead remove the wounds only from your units, and a wound from your Phoenixborn! 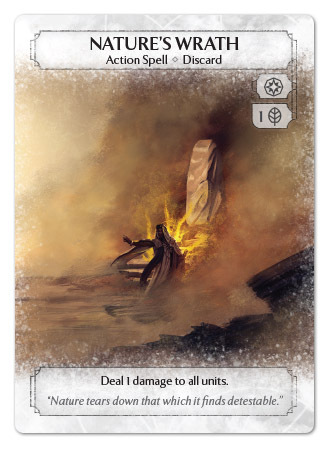 In Ashes units cycle fairly quickly. With a few exceptions, most units only stick around for a round or two. Because of this, healing is often a suboptimal choice compared to simply cycling the unit out for a fresh one. Mass Heal comes in at a dirt cheap price point to ensure viability when compared to recycling effects like Blood Chains. The low cost also means it’s playable in a wider variety of decks, though running Divine is probably still recommended. Just remember to meditate the round before you need to play Mass Heal. X: I love the way the cost and effect of the card is designed. Unfortunately, the number of uses of this card are highly meta dependent. When cards like Mist Typhoon, Nature’s Wrath, One-Hundred Blades, or Summon Gilder are popular this card can be great, resetting the board and mitigating a lot of your opponent’s resources. But, if the meta uses large units and spot removal, where Units are either healthy, nullified, or destroyed, this card is generally not going to be worth the deck spot. Cards like this make, we wish there was a small sideboard, to slightly modify a deck based upon match up. N: I like this card. It’s aggressively costed, and I think the Divine die requirement is a cool way to tie it to that die type, while still keeping the card’s options open. I can definitely see running this in some bigger swing decks (especially ones that might have the new Nature’s Wrath) that don’t necessarily have the place for Heal, bt could run some cards that help them on the board as well. The final card for today, and this expansion, is the new Ally, Pain Shaman. For a Divine Power, Nature Class, and a Basic, you’ll receive a 2/3/3. Pain Shaman also has a new ability called Exchange Pain 1. This allows him to deal 1 damage or remove a wound token from a target unit after the Pain Shaman receives damage. The 1 Power, 1 Class, 1 Basic is the home of a lot of powerful allies. At 2/3/3 the Pain Shaman is going to need to deliver in other ways to be competitive against these other cards. It’s ability, Exchange Pain 1, allows the Pain Shaman to dish out or heal damage after it receives it. The two different effects means that Pain Shaman can be used in a ton of ways, whether it’s keeping your opponent’s unit at low (or zero) health, or keeping your own troops alive, Exchange Pain 1 is very versatile. It’s also worth noting that once the Shaman has been wounded once, it effectively gives him the Armored 1 ability, if you so choose. It can be triggered easiest with self dealing effects, such as Small Sacrifice or the new Nature’s Wrath and Earthquake, but also works when the Pain Shaman takes damage in battle. It will not work, however, if any preventative measures, like Particle Shield or Protect, are used. It’s also susceptible to the ever present Bear, who can Freeze the Shaman before his ability triggers. Altogether Pain Shaman is a little tricky to use. You’ll need to carefully control the amount of damage he’s taking, while at the same time trying to time the Exchange Pain for best affect. The longer he stays alive, the more damage he’ll be able to reflect back on your opponent. 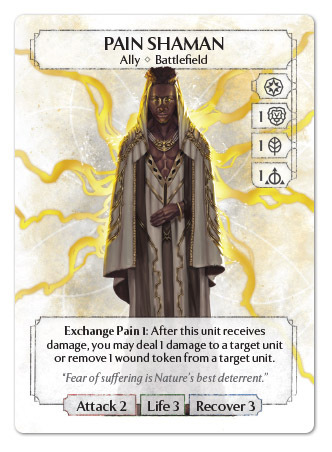 X: This is one of my favorites of the 3 cost Ally cycle. I love this card so much. Unfortunately, it’s basically a self-defeating prophecy. If ping damage is popular, this card is great, and decks begin to include spot removal to deal with their opponent’s Pain Shaman. And if decks are using lots of spot removal and big units, then this cards value is greatly diminished, requiring you to bring your own triggers to get value out of the Pain Shaman. N: I like that he can trade with the other 3 cost allies. I think that’s going to be important in viability in competitive play. I kind of wish Pain Shaman was in Ceremonial rather than Divine, since Small Sacrifice immediately puts you into 4 colours. I’m definitely going to be trying him in some sort of self dealing damage deck along with stuff like Dread Wraith and Leech warrior. However I’m not holding out hope that it’ll be an extremely competitive deck. Thanks for joining us for this series of articles! That wraps up Xander’s deck, which should be in stores very soon! The King of Titans brings a lot of powerful new units to the battlefield. We’ve got a ton of new spells that will change of the meta in major ways! What are you most looking forward to? Are you planning to shake things up with new Mounts? Planning to return to old strategies that were countered by Kneel with the protection of Sacred Ground? Let us know! For now, however, the sun rises, and we must Fade Away. Look out for the return of Figures in the Fog when the next expansions are spoiled! Copyright © 2019 Strange Copy. Powered by WordPress and Stargazer.